High Park Labyrinth is nestled in a grove of nature just west of the Dog Off-Leash area and north of The Grenadier Restaurant. The High Park Labyrinth sits on the remnants of the original restaurant in High Park, built in the 1920s and burnt down in 1956. This gives the space history as a gathering place for people. It has been enjoyed by many since it was originally installed in 2001. It is listed on the World Wide Labyrinth Locator and the Labyrinth Community Network listing. A walking meditation, its circles are a reminder of natural cycles, of the seasons and of nature, making the park a perfect home for the labyrinth symbol. It has graced the contemplative thoughts of thousands of people who have known about it’s presence or happened upon it. The High Park Labyrinth is open to seasonal celebrations for many different groups, is used by schools, teachers, camp leaders, people recovering from illness, grief or other problems, and also by those who are just enjoying a walk through the park. 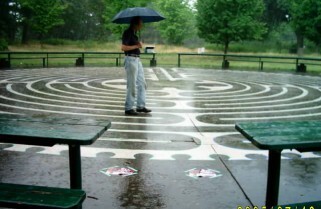 Walking the labyrinth increases focus and concentration. As we walk, we pay more attention to our breathing and our thoughts. We can also learn to let go and trust in ourselves and our abilities to make decisions and that the path will always lead us where we need to be. Because we walk in contemplation it is an excellent tool for these practices and many children who were introduced to the labyrinth throughout the years, still use it when they need to focus now that they are older. Stay tuned for upcoming announcements and events. 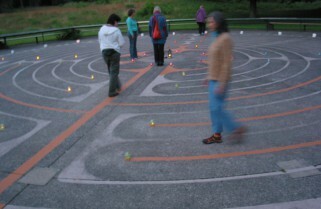 If you would like to reserve the labyrinth for your group walk, please contact labyrinth@highpark.org. There is no charge and no permit required for the time being but a donation to the labyrinth renovation project is suggested.